The B class Avan Ovation M3: a budget-conscious, comfortable tourer for two. We recently took a long, hard look at the Avan Ovation M7 Slide-Out. This van sat in the higher end of this manufacturer’s large, luxurious motorhome range, but I couldn’t help but wonder about Avan’s smaller rigs. The Ovation line-up consists of an impressive 17 layouts, from the 6.96m M2 to the 7.92m M10. Each van, aside from the M10, is available as a B or C class unit, the main difference being that the C class variants have a Luton peak (the space over the driver’s cab) with a double bed. While the M7 impressed with its size, a layout that could sleep four or more people, and some design tweaks compared to earlier M7s, we wanted to see what its little brothers had to offer. The B class M3 is almost 1m shorter than the the M7 and almost 800kg lighter. With spring finally arriving, we climbed aboard the M3 to assess some of the differences. Like all vans in the Avan Ovation range, and the Applause motorhome range too, the M3 can be driven on a standard driver’s licence. The M3 is built on the same base vehicle as the M7 Slide-Out, the Fiat Ducato Maxi. While the M7 was a very pleasant drive, from a standing start the four-cylinder turbodiesel engine had to dig a little for the power to ascend steep hills. The smaller, lighter M3, however, had power in reserve when climbing steep gradients, the intuitive automatic-manual transmission shifting smoothly at all times. There are a number of factors that make the Ducato a suitable motorhome base vehicle. Among them, I rate its around-town manoeuvrability and tight turning circle very highly. I felt quite confident at the helm of the B class M3 on the highway and filling up with diesel at the servo. Furthermore, there were very few squeaks and rattles from the living quarters as I navigated freeways and secondary roads. Our M3 sported Avan’s ‘Style’ pack, a no-cost interior decor option that retains the company’s signature ‘timber look’ with the addition of two-tone locker doors. The glossy, cream-coloured finish provides a small, but welcome, touch of class to the interior. It involves a couple of compromises, but I liked the M3’s layout. Access to and from the driver’s cab is easy – no Luton peak means no chance of bumping your head – and all living ‘zones’ are clearly defined. Directly behind the driver’s cab is the offside dinette, with two seatbelts fitted to the lounge so the van can carry a maximum of three passengers. The adjacent nearside lounge functions also as extra seating at meal times. The tabletop is secured to a couple of rails, allowing it to slide sideways to make room for a matching infill. This not only increases the size of the table, it puts it within reach of anyone sitting on the nearside lounge. The dinette also incorporates a flatscreen TV and a Panasonic speaker. Both are positioned so you can kick back on the nearside lounge to watch your favourite shows. The dinette could use a 12V point or two, though. The offside kitchen has a three-burner cooktop, a sink and a drainer, as well as a Dometic oven mounted in the cabinetry below the bench, but workable bench space here is limited. There are two choices: prepare meals on the closed glass lids covering the sink and cooktop, or use the dinette table. While anyone would prefer more bench space, in a layout that includes so much in a limited space, something has to give. Directly opposite you’ll find a large three-way fridge-freezer with a microwave on a shelf above, hidden by a roller shutter door. In the rear corner, Avan has fitted a double bed that, to my mind, represents the only other layout compromise. It is undoubtedly a cosy proposition, and whoever sleeps against the wall will have to climb over their partner to visit the loo during the night. The under-bed storage space can be accessed by lifting the mattress (which is actually split into two separate mattresses to make this job easier); however, it would probably be easier to access it from outside the motorhome via the rear-nearside bin. Finally, the bathroom which, in the M3, really stands out. Tucked next to the bed, it offers a separate shower, a small vanity and a cassette toilet, with room left over to towel off and get dressed. 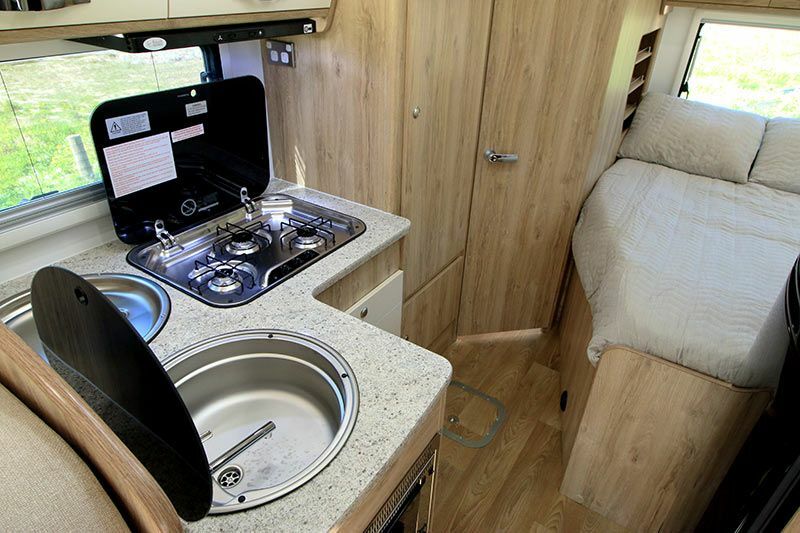 There are a number of storage options throughout the motorhome, including overhead cabinets wherever practical, a large wardrobe between the kitchen and bathroom, and even a little cavity under the oven. Personally, I reckon a drawer would work well here, rather than just a door, but that’s just me. Oh, each overheard locker door has a soft-close function – just nudge it to a certain point and the door will gently do the rest. A reverse-cycle air-conditioner, a gas-fired space heater and block-out blinds throughout, including blinds that cover the windscreen and other cabin windows, are also part of the M3 package. All Avan Ovation motorhomes are built with composite aluminium cladding, with flooring comprised of a 9mm polypropylene sheet covered internally by vinyl. Ovations from M6 to 10 are built on an Al-Ko chassis; however, being smaller, the M2 to M5 are each built on the standard Fiat Ducato motorhome chassis. External appointments include two nearside storage bins, with the aforementioned rear bin also offering a ‘hidden’ compartment – lift the hinged floor to reveal additional storage space. No picnic table is provided but a full-length wind-out awning is, along with a reversing camera. Two 9kg gas cylinders are provided in a bin on the offside. The B class Avan Ovation M3 weighs in at 3170kg Tare. Its 4400kg GVM provides for a massive payload capacity – more than you’re ever likely to need – but remember that the more the vehicle weighs, the harder the engine will have to work and the more diesel it’ll use. The B class Avan Ovation M3 is a nimble performer on the open road, easily able to keep up with traffic. Noise from the living quarters is negligible, the driver’s seat affords a commanding view of the road ahead, and the large side mirrors offer decent rearward vision. Although this motorhome is an ‘entry level’ Ovation, it presents as good value and comes out of the factory with most, if not all, of the equipment you’d need to get rolling around Australia. Previous articleReview: Viscount Caravans is Back!